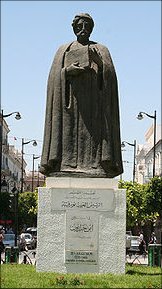 Abd al-Rahman Ibn Mohammad is generally known as Ibn Khaldun after a remote ancestor. His parents, originally Yemenite Arabs, had settled in Spain, but after the fall of Seville, had migrated to Tunisia. He was born in Tunisia in 1332 A.D., where he received his early education and where, still in his teens, he entered the service of the Egyptian ruler Sultan Barquq. His thirst for advanced knowledge and a better academic setting soon made him leave this service and migrate to Fez. This was followed by a long period of unrest marked by contemporary political rivalries affecting his career. This turbulent period also included a three year refuge in a small village Qalat Ibn Salama in Algeria, which provided him with the opportunity to write Muqaddimah, the first volume of his world history that won him an immortal place among historians, sociologists and philosophers. The uncertainty of his career still continued, with Egypt becoming his final abode where he spent his last 24 years. Here he lived a life of fame and respect, marked by his appointment as the Chief Malakite Judge and lecturing at the Al-Azhar University, but envy caused his removal from his high judicial office as many as five times. Ibn Khaldun's chief contribution lies in philosophy of history and sociology. He sought to write a world history preambled by a first volume aimed at an analysis of historical events. This volume, commonly known as Muqaddimah or 'Prolegomena', was based on Ibn Khaldun's unique approach and original contribution and became a masterpiece in literature on philosophy of history and sociology. The chief concern of this monumental work was to identify psychological, economic, environmental and social facts that contribute to the advancement of human civilization and the currents of history. In this context, he analysed the dynamics of group relationships and showed how group-feelings, al-'Asabiyya, give rise to the ascent of a new civilisation and political power and how, later on, its diffusion into a more general civilization invites the advent of a still new 'Asabiyya in its pristine form. He identified an almost rhythmic repetition of rise and fall in human civilization, and analysed factors contributing to it. His contribution to history is marked by the fact that, unlike most earlier writers interpreting history largely in a political context, he emphasised environmental, sociological, psychological and economic factors governing the apparent events. This revolutionised the science of history and also laid the foundation of Umraniyat (Sociology). Apart from the Muqaddimah that became an important independent book even during the lifetime of the author, the other volumes of his world history Kitab al-I'bar deal with the history of Arabs, contemporary Muslim rulers, contemporary European rulers, ancient history of Arabs, Jews, Greeks, Romans, Persians, etc., Islamic History, Egyptian history and North-African history, especially that of Berbers and tribes living in the adjoining areas. The last volume deals largely with the events of his own life and is known as Al-Tasrif. This was also written in a scientific manner and initiated a new analytical tradition in the art of writing autobio- graphy. A book on mathematics written by him is not extant. Ibn Khaldun's influence on the subject of history, philosophy of history, sociology, political science and education has remained paramount ever since his life. His books have been translated into many languages, both in the East and the West, and have inspired subsequent development of these sciences. For instance, Prof. Gum Ploughs and Kolosio consider Muqaddimah as superior in scholarship to Machiavelli's The Prince written a century later, as the forrner bases the diagnosis more on cultural, sociological, economic and psychological factors.